Hello! 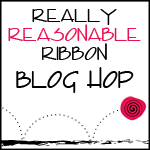 Welcome to another Really Reasonable Ribbon Blog Hop! We'll be hopping on the 13th of every month, so we hope you'll join us:) Hopefully you came here from Susan's Blog, but if not, then start at the beginning which is the Really Reasonable Ribbon Blog! As a Ribbon Club Designer, I get to show off ribbon from the June Ribbon Club Asst. I found that the ribbon goes PERFECTLY with the colors in the Basic Grey Origins paper pad. I decided to go with a fun summer themed card, and used this adorable Kraftin' Kimmie image named Florence. Doesn't she look glamourous soaking up the rays:) For my ribbon I used some fabulous Yellow Gingham Ribbon (love gingham!!!) and I also made a little yoyo flower with the Lime Stripe Grosgrain Ribbon. The sentiment comes from the PTI set Blooming Button Bits, and the sun rays come from the PTI set Up, Up, & Away. This is also for the All That Scraps Challenge to use Buttons and Ribbon and the Kraftin' Kimmie Challenge#33~Beachy Keen! love your sunny card....great colouring of the image...the fab ribbons go so perfectly the the DP! Totally cool, Kerri - I love the colours you used!! she is adorable and since I love the Origins, the ribbon is perfect! What a fun, summery card! The ribbon looks wonderful. So creative! This is one fabulous and inspiring card. Love the colors, layout and how you used the ribbon. Absolutely gorgeous! So bright and sunny! Beautiful coloring! Love the image - adorable! Fantastic job! How stinkin sweet is that image??? I love your coloring Kerri. Makes me want to phone ya and set up a coloring play date hehe. The colors are so pretty on here. Really nice card! Very cool card! Love the image and the sentiment. Awww Kerri this is SUPER CUTE hun!!! love it, and hope you have a very nice day!!! Your card just screams summer! I love the bright colors. Love it! Your KK looks just perfect sitting in the rays of the sun! Cute little bow too! Such a bright and fun card! AWESOME!! Your card is so adorable! I love the colours and the cute image. I love the strong colors. Great coloring and nice dp. SO- SOS CUTE!! LOVE IT!! Bright, beautiful, sunny card. Florence is adorable. OMG Kerri she is ADORABLE...I LOVE your fun colors wow wow wow TOOOOO CUTE! Hope you are having a wonderful weekend girl!!! Hugs! What a perfect summer card! I love that Kraftin Kimmie! using gingham ribbon makes anything homey, cozy and familiar. heheh that's so summery and fun! This card ROCKS!! What a great summery look. Those colors are just awesome!! Oh! She is FABULOUS Kerri! LOVE this! Very pretty card Kerri!! Love the coloring you did!! Thanks for joining us at ATS Wednesday Challenge!! Oh what a happy, relaxing card! Love the stamp! And your colors are beautiful together, so Summery! OH MY!! Florence looks like a superstar!! Absolutely gorgeous and thanks for joining us for this week's Kraftin' Kimmie challenge! Fabulous card, Kerri! Love the fun summer colors! Ribbon you chose looks so pretty here! Love the button and ribbon flower you added! Well, it looks like I made my blog hop comment on the wrong card. I love this one, too. You are such a fantastic designer. I'm going to go back and look all through your blog because I think I want to follow it. Thanks so much for contributing to the blog hop. P.S. I do love that big flower though!!! It makes me want to go sit in the sun. Of course, lathered in SPF 50, so I don't get burnt, but still. It's sunshine!